Located in the picturesque town of Sawyer, MI stands this immaculately built new construction home. Welcome to Wheel Tree Cottage! This four bedroom, 2.5 bath home on a secluded one acre lot has everything a renter would want on their getaway. You will love the gourmet kitchen complete with an industrial six-burner gas stove, ice maker, wine fridge, two coffee pots along with coffee bean grinder, and much more. Kick back and relax in family room with the 70" flat screen TV or cozy up to the wood burning fireplace. For the off-season renters, you will appreciate the under floor heating that is throughout the first floor of home. Open concept family room/kitchen with plenty of room for both seating and entertaining. The kitchen island seats up to five while the dining area can seat an additional nine more. Spacious screened-in porch as well that seats six for dining plus additional seating. Second floor bunk bedroom also has a flat screen TV for the kids. Backyard boasts a gas grill along with outdoor firepit, perfect for roasting s'mores on those starry summer nights. For the techies in the group, there is a Sonos sound system that will play your favorite tunes in main room, back porch, and back patio. Have an electric car? No problem, the heated garage is also equipped with a car charging station! Just a short distance from Warren Dunes beach as well as downtown Sawyer. 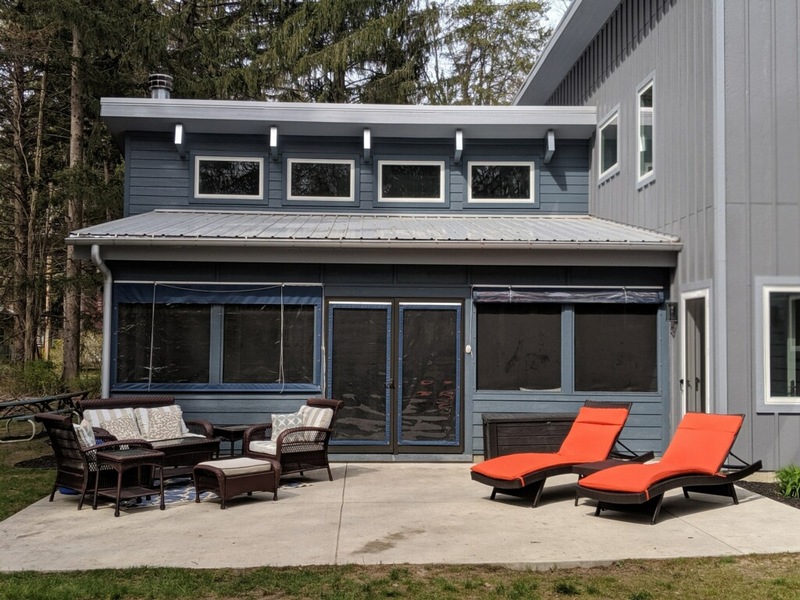 All the amenities you would expect in a quality rental including internet, cable, gas grill, A/C, screened-in porch, wood-burning fireplace, outdoor firepit, gourmet kitchen, under floor heating, electric car charging station, and much, much more! This is a brand new listing so calendar is wide open for 2019, book today! The northernmost community of Harbor Country, Sawyer, has grown tremendously over the past few years. It is home to a local craft-brewery, a destination garden center, restaurants, antique stores, and an old-fashioned hardware store. It is home to Warren Dunes, a State Park with several hundred acres of dune lands, campgrounds and beaches.